Pha That Luang or “Great Stupa” is the most important Buddhist monument in Laos. The large golden stupa in Vientiane is believed to enshrine a breast bone of Buddha. 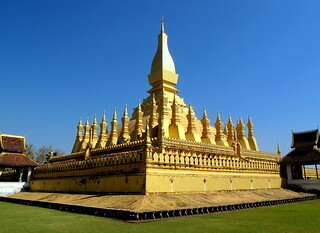 Pha That Luang was built in 1566 after Vientiane was made the new capital of the Lan Xang Kingdom. At that time the pagoda was covered with gold leaves. In 1827 most of Vientiane was destroyed and looted by Siamese invaders. Pha That Luang was heavily damaged and eventually left abandoned. It was rebuilt in the 1930’s by the French to its original design. The temple has been submitted to the Tentative List of UNESCO World Heritage Sites.